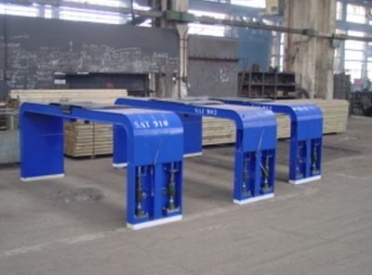 Transport trestle for short sea transportation of semi-trailers, which is fitted with 2″ kingpin for Terminal Tractor handling. On the top trestle a special high load fifth wheel is included for attaching the semi-trailer. It has a manual release handle incorporated and an indicator pin will show correct locking of the trestle to the semi-trailer. 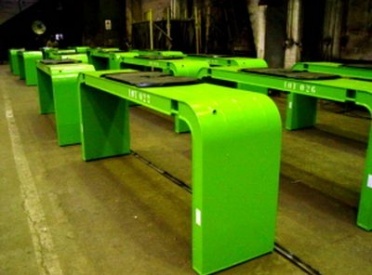 Rubber pads under trestle legs will prevent the trestle from sliding under normal weather conditions. In hard weather lashing is required. Your solution to a safe, fast and cost effective Ro-Ro operation. The trestle is locked to ship deck by 4 twistlock.